This just goes to prove that Star Wars toys can be used to promote anything. Witness this new, and oh so cool toy that combines two of my childhood loves, robot toys that transform into stuff and giant planet blasting space stations. More than meets the eye for sure here. The name of this toy is the Hasbro Star Wars Transformer Deluxe Death Star. That is a long name for what boils down to a Transformer that looks like the Death Star on the outside and transforms into Darth Vader complete with his light saber. In Death Star mode the toy has a launching projectile and electronic lights. A blaster is also included that makes sound effects. Additional items included are a Darth Vader mini figure, two TIE Fighter mini vehicles and three Stormtrooper mini figures. 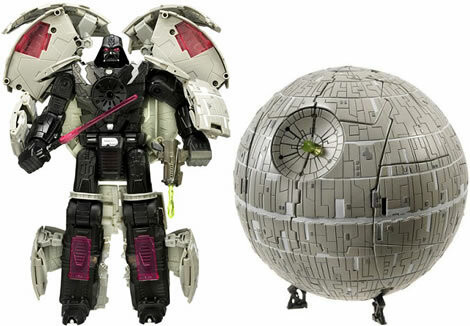 The Death Star Transformer is priced at $49.99 and is currently out of stock at Amazon. I don’t know about you but in a brawl between Darth Vader and Megatron, my money is on Darth Vader.